Byron Bay is a beachside town located in the far-northeastern corner of the state of New South Wales, Australia. It is located 772 kilometres (480 mi) north of Sydney and 165 kilometres (103 mi) south of Brisbane. 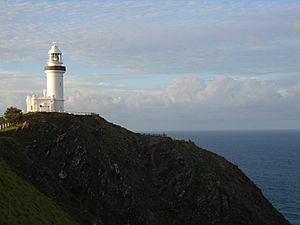 Cape Byron, a headland adjacent to the town, is the easternmost point of mainland Australia. At the 2011 census, the town had a permanent population of 4,959. The town is in turn the nucleus of Byron Shire, which had 29,209 residents. The local Arakwal Aboriginal people's name for the area is Cavvanbah, meaning "meeting place". Lieutenant James Cook named Cape Byron after Naval officer John Byron, circumnavigator of the world and grandfather of the poet Lord Byron. The history of Europeans in Byron Bay began in 1770, when Lieutenant James Cook found a safe anchorage and named Cape Byron after a fellow sailor John Byron. The first industry in Byron was cedar logging from the Australian red cedar (Toona ciliata). The timber industry is the origin of the word "shoot" in many local names – Possum Shoot, Coopers Shoot and Skinners Shoot – where the timber-cutters would "shoot" the logs down the hills to be dragged to waiting ships. Gold mining of the beaches was the next industry to occur. Up to 20 mining leases set up on Tallow Beach to extract gold from the black sands around the 1870s. Byron Bay has a history of primary industrial production (dairy factory, abattoirs, fishing, and whaling until 1963) and was a significant, but hazardous, sea port. The poet Brunton Stephens spoke of cattle grazing on the "mossy plains" of Cape Byron in a poem he penned in 1876. The first jetty was built in 1886, and the railway was connected in 1894, and Cavvanbah became Byron Bay in 1894. Dairy farmers cleared more land and settled the area. In 1895, the Norco Co-operative was formed to provide cold storage and manage the dairy industry. The introduction of paspalum improved production, and Byron Bay exported butter to the world. The Norco factory was the biggest in the southern hemisphere, expanding from dairy to bacon and other processed meat. Longboard surfers arrived in the 1960s and used natural breaks at The Pass, Watego's, and Cosy Corner. This was the beginning of Byron Bay as a tourist destination, and by 1973, when the Aquarius Festival was held in Nimbin, its reputation as a hippy, happy, alternative town was established. Shipwrecks litter the bay and surrounding areas. 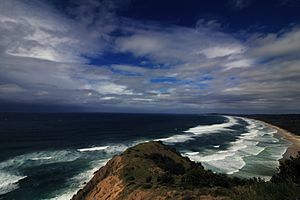 Byron Bay is part of the erosion caldera of an ancient shield volcano, the Tweed Volcano, which had erupted 23 million years ago. The volcano formed as a result of the Indo-Australian Plate moving over the East Australia hotspot. Byron Bay has a humid subtropical climate (Cfa in the Köppen climate classification) with hot summers and mild winters. Winters are not cold with daily maximums usually reaching 19.4 °C and a minimum of 11 °C. Summer can be hot, with a daily average of 27 °C. Summer evenings can be wet, cooling the day down. The town has several beaches which are popular for surfing. It is a resort popular with both domestic and international tourists, including backpackers, who travel along the Australian coast; the scenery also attracts skydivers. The area is also noted for its wildlife, with the whale watching industry a significant contributor to the local economy. An oceanway runs from the centre of town to the Cape Byron lighthouse. This allows visitors to walk and cycle to the lighthouse. Events held at Byron Bay include the Byron Bay International Fashion Festival on the 29th of April and major national music festivals such as the East Coast Blues & Roots Music Festival at Easter, Falls Festival and Splendour in the Grass, the Byron Bay Writers Festival, the Byron Bay Film Festival, Byron Bay Surf Festival, Byron Spirit Festival and the Byron Underwater Festival. The vibrant musical community has produced internationally renowned bands such as Blue King Brown, Parkway Drive and 50 Lions. also many yoga retreats, pagan gatherings, The Byron Bay Triathlon is held on the second Saturday in May every year. 1,300 competitors from many different countries enter this Olympic Distance event. Byron Bay also has a number of regular markets including a weekly farmers' market at the Butler Street Reserve every Thursday with over 70 local farmers selling fresh produce. There is also a Byron Community Market held on the same site on the first Sunday of each month and the Artisan Market held on Saturday evenings at Railway Park from October to Easter. There are three annual specialist Beachside Markets held in January, Easter and September. Until 2004, Byron Bay railway station provided a connection on the Casino to Murwillumbah railway line. It was served by trains from Sydney and for various periods also by services originating at Casino that connected with expresses running between Sydney and South Brisbane. A bus station in Jonson Street is now serviced by Greyhound Australia, NSW TrainLink and Premier Motor Services coach services from Sydney and Brisbane. A 3.4 km section of the Murwillumbah railway line is to be rehabilitated in 2016 for a two car self-propelled diesel train planned to run from the town centre to the Elements of Byron resort and nearby attractions. An earlier local train service, known as the Byron Bay Tram conveyed passengers from about 1928 until about 1954 between the railway station and the "new jetty" where connections were made with passenger carrying ships of the North Coast Steam Navigation Company. Motive power was a Simplex petrol locomotive, locally known as the "Green Frog", and the passenger vehicles comprised former Newcastle B2 class steam tram trailer 74B and former Sydney C class electric tram C37. After the trams stopped running both the cars went to a heritage tramway in Parramatta Park where 74B was destroyed by fire. The Simplex was built in Bedford England and went into service in 1923 shunting freight to and from the "old" jetty adjacent to the township and then to "new" jetty to the north when it was completed in 1928. Later it hauled whales from the jetty to the rendering down works, livestock to the meat works, mineral sands and meat wagons to the station for onward movement and regularly shunted Norco and other railway sidings and between these duties ran the passenger tramway until the coastal passenger shipping service stopped. The Simplex locomotive was retired in 1984 when the meat works closed and is now stored in a shed near the Kendall Street level crossing under the care of volunteers and the Byron Bay Council. A number of well-known sporting teams represent the local area. The Byron Bay Surf Club is the longest standing of any of the current clubs, it has been one of Australia's leading surf club's and has been in continuous operation for more than 105 years. The well known rugby league club named the Byron Bay Red Devils and the Australian rules football team Byron Magpies. Byron Bay FC has won the Football Far North Coast Premier league 3 times the latest being 2013. Other clubs include Byron Bay Golf Club, Byron Bay Cricket Club, Byron Bay Rugby Union Club, Byron Bay Gliding Club, and the Byron Bay Bowling Club. The Byron Bay Ocean Swim Classic is held every year as well. John Macgregor's 1986 novel Propinquity is partly set in Byron Bay and nearby Mullumbimby. The 2008-2009 ABC drama series East of Everything, written by Deb Cox and Roger Monk, is set in the fictional town of "Broken Bay" which is based on a somewhat more run-down version of Byron Bay and its surrounds, with much of the filming taking place in and around Byron Bay including obviously recognisable landmarks such as the lighthouse and local beaches. The town also features in the 2016 open world racing video game, Forza Horizon 3. Byron Bay, New South Wales Facts for Kids. Kiddle Encyclopedia.